Rebel Legion :: View topic - Finished with R2! Posted: Sat Mar 24, 2018 2:24 pm Post subject: Finished with R2! Thought you guys would like to see how he turned out. After 2 and 1/2 years of blood, sweat and tears ( and not a little bit of cursing ), the near-sighted scrap pile is finally done! Getting charged up for the first time. 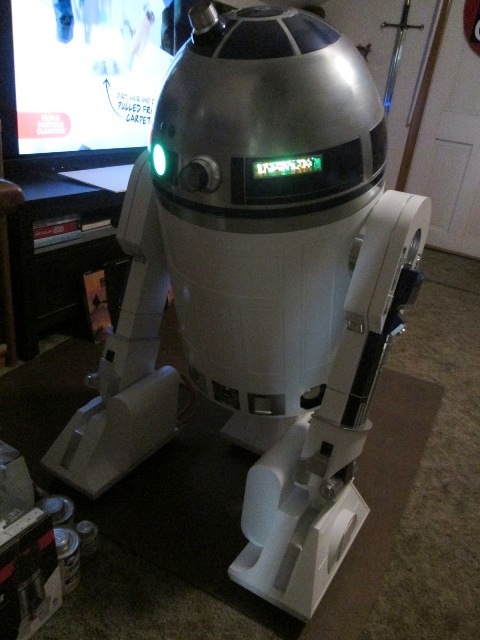 The little guy is fully operational with working foot motors, dome motor, lights and sound. The majority of the build was scratchbuilt from styrene with the exception of the dome and various resin and 3D printed detail parts purchased from vendors over on Astromech.net ( those guys make some really excellent parts! ). In addition, there are working lights behind the charge bay and data panel doors as well as a rotating holoprojector that also lights up. It's been a fun project, but I'm glad it's at a stopping point for a while - I've been working on this project almost non-stop for the past year and literally finished him up the day before The Last Jedi opened! Although he's done for now, I am planning on adding a computer arm and gripper claw inside his long front doors and maybe a periscope and scanner in the dome as well, but not for a while yet. Now I need to start researching a pilot or hanger tech uniform as it would be nice to look the part while driving the little guy around at events. Anyway, that's it for now - thanks for looking! R2 posing with some friends outside our local theatre on the premiere of The Last Jedi. If you plan to take him to events, be prepared to do repairs to the feet. Unfortunately, styrene droids foot shells really take a beating at events. And if taking him to cons and such where he'll be parked for long periods of time, you might consider investing in at least 3 or 4 crowd control stanchions and a sign frame with a "Don't touch the Droids" sign. People will still grab at it when you aren't looking, but that should cut down on most of the abuse. Thanks for the tips, David! I've had R2 out a couple of times with no problems so far, but they've been fairly small crowds and generally well-behaved. I reinforced the feet as well as the bottom skirt pieces, so hopefully those will help minimize any damage caused from collisions or over-eager feet. I will definitely look into getting some signs and stanchions as those are a must for static displays. I probably won't be doing any large events any time soon ( still need to build a transport dolly for the body ) or anything involving large bands of out-of-control younglings - I'll leave that to the handful of fellow droid builders who have engineered their R2's into radio-controlled tanks that can withstand just about anything short of a mortar shell blast! I reinforced the feet as well as the bottom skirt pieces, so hopefully those will help minimize any damage caused from collisions or over-eager feet. I think constantly driving over sidewalk cracks, door thresholds, ect.. will also take it's toll on the feet after a while. A guy I know with a styrene droid was taking his to numerous events and then began to have constant problems with the wheels and motors breaking loose, and then jamming up. It's possible that he may have only tried to put patches on the problem areas, instead of taking the feet completely apart to make proper repairs, but it seemed like every event he went to, he would drive the droid in and then have to carry it out. Having a cart that you can wheel the droid in on would definitely save it from many of the stresses that the feet would experience when bringing it in from the parking lot. I don't know how many times I've had to drive my Droid in from a parking lot or garage that was 2 or 3 blocks away from the event. 2-3 blocks? Yikes! I am planning to build a small dolly/sled next week to move the body around easier. There's a local event coming up in a few weeks, and I definetly don't want to drive him over sidewalks & streets to get there. Our local baseball team has railroad tracks between the parking garage and the stadium that you need to lift the droid over. You are the first one in, and the last one out, which means at least 6 to 7 hours for the event. (You don't get to watch any of the game). When the game is over, all streets are blocked to incoming traffic, which means you can't drive back up to the loading dock to load up your Droid. In the rare case where they are willing to let you park in the stadium parking garage, the gate guard will want to know the contact person (AKA ball park manager, or person in charge) that said you can park there. And usually the only contact person that I know of is the 501st Event coordinator that the gate guard knows nothing about. And that's not mentioning any of the abusive and disgusting things that some sports fans who have access to alcoholic beverages will do to your Droid during the event. At this point I refuse to do any more Sports team events. Alcohol and R2's do not mix! I remember reading a thread over on Astromech that a drunk fan at a Star Wars-themed game started pouring his beer into somebody's R2! ( that wasn't your droid, was it? ) Unbelievable what some people do. I would go diesel on somebody if they tried that. That happened with one of our local guy's R5-D4. 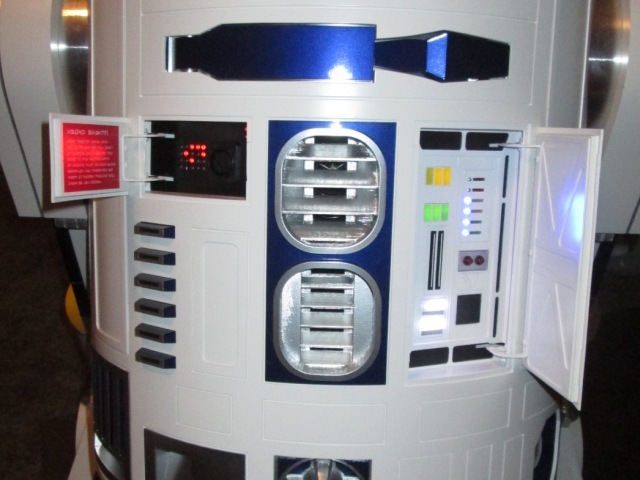 Fortunately for me, no one has tried to pour beer on or into my Droid. There has been a couple of unintentional near spills with my Droid at sporting events. 99 percent of people are polite and just want to take their picture with the Droid, but there is always at least one or two that insist on being an obnoxious jerk, and makes me wish I had installed a working arc zapper arm (Tazer). Punching or kicking the Droid is common as well as hitting him with something that they are carrying. Climbing on top of the Droid has happened a couple times, and there has even been a couple people perform a horny dog act with him. I would not even suggest going to such an event without someone to be the Droid's bodyguard at all times.